How Can I Help? - Stop Overfishing! Overfishing is Over-Rated. Stop Overfishing! Stop Overfishing! Overfishing is Over-Rated. Can We Help Stop Overfishing? Easy ways that YOU can help stop overfishing! -Buy fish that were raised in fish farms. Fish raised on fish farms are cheaper and they aren't fish from the ocean. -Limit buying fish fresh from the ocean. The higher the demand is for ocean fish the higher the amount of fish taken from the ocean will be. 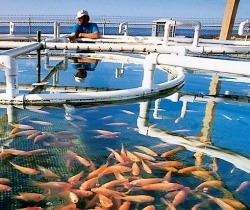 -Look into starting a fish farm!! Fish farms are a great way to supply our demand for fish WITHOUT overfishing the oceans. -Look for fish that aren't overhunted. Some types of fish are more abundant than others. If you have to buy fish from the ocean look for fish that are not close to extinction. -Brainstorm different ways to fish large amounts of fish. Unselective fishing techniques cause bykill; if we think of another way to catch large amounts of fish, then overfishing wouldn't be as big of a problem. Think up a reasonable idea, then campaign it. Fishermen might actually try your idea! -Raise awareness. Talk to friends, neighbors, and family about overfishing and ways to stop it. If we all work together then we can stop overfishing!! !